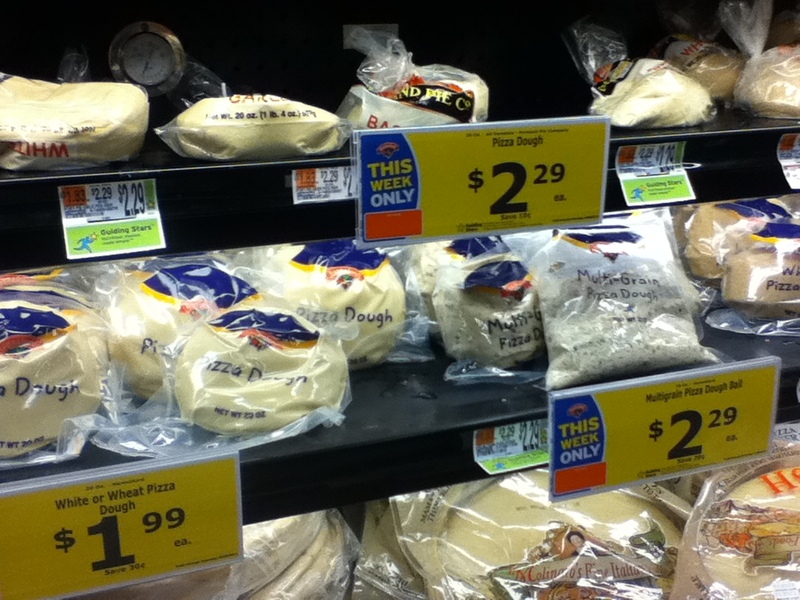 Just say no to pre-made dough! You can make much cheaper, better tasting, more satisfying dough at home. 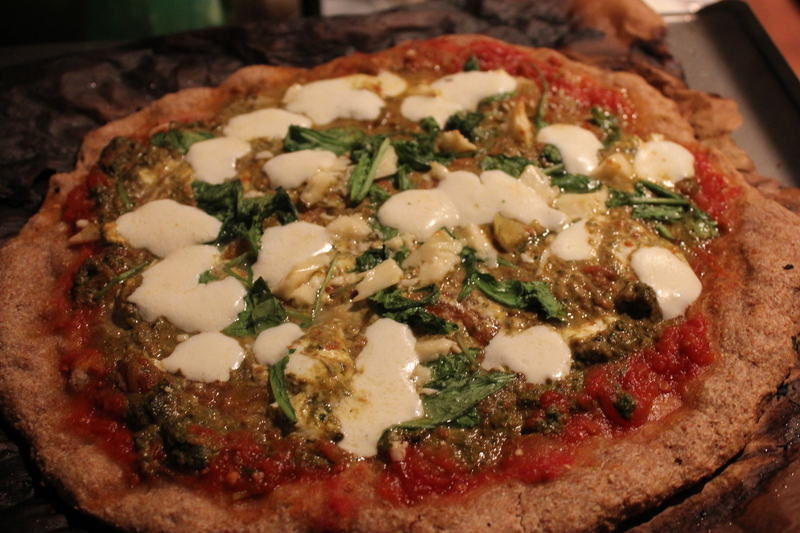 All spring and summer, I’ve meant to blog about my new zeal for homemade pizza. We’ve enjoyed pizza with roasted asparagus (thanks Deena! ), pizza with garlic scapes and clams (now in Maine I’ll only use fresh ones), pizza topped with feta, Parmesan and Pecorino, fresh mozzarella and chêvre, pizza crust made from Willamette Valley-grown hard red wheat and even some rye (Alice Waters and others recommend this addition). The key to good homemade pizza is a good dough. And I have finally found the go-to dough of my dreams in Piper Davis and Ellen Jackson’s fool-proof recipe from their ever-reliable (Portland and Seattle favorite) The Grand Central Baking Book. I’m much more improvisational cook than methodical baker, but Davis and Jackson have me seriously considering playing for the other team. The key to good pizza, as revealed by this book, is a pre-ferment, otherwise known as a poolish or overnight starter. This quick night-before step yields an incredibly chewy yet crisp crust with bubbling air pockets like a good artisan bread. You simply mix flour, water and yeast together and let it sit for about 12 hours. It’s then riddled with holes, with the stringy consistency of melted cheese when stirred (photo is on my other camera card). Then you mix it with the other ingredients (bless you, KitchenAid dough hook!) into dough. No proofing or activating yeast with sugar or honey. Davis and Jackson are also call for a generous amount of salt. That’s key to a flavorful dough. And make sure your flour isn’t rancid. The pre-ferment softens the glutens in a tough hard whole wheat flour, so you don’t need to add white flour. I can’t locate the cookbook in my moving boxes at present, but its pan pizza recipe (which also stresses the pre-ferment) is at least online. Grilled pizza for the first time, with just-made tomato sauce, fresh pesto, some wilted arugula, goat cheese, garlic, mozzarella, and Capriano, a hard aged goat cheese from York Hill here in Maine. I won’t burn the crust on the bottom next time. A pizza peel is also almost essential (thank you, dear Intaba!). Once you have one you won’t look back. You, too, really can flick your pizza into the oven or on the grill with confidence. A pizza stone (thank you, dear Hannah!) or at least some unglazed ceramic tiles heated on the rack at at least 450 degrees 30 minutes before baking makes a world of difference. And because The Grand Central Dough is so wet (wet doughs seem to produce superior pizza), it’s hard to handle by hand (so my partner can’t show off his pizza-tossing skills), Davis and Jackson brilliantly recommend stretching it out on parchment paper. The paper chars on the edges but remains moist and intact under the dough, slipping away from the baked pizza. Only trouble is I discovered tonight, my ChefPapel “culinary parchment” is only “oven safe” up to 425 degrees. Suggestions? Are there more heat-resistant parchments out there? This particularly was a problem when I tried to grill pizza for the first-time tonight, with temperatures that can approach 600 degrees. Any good grilled pizza techniques to recommend? I consulted this one, but my wet dough kind of stuck to and charred on the grates. Otherwise, I’m planning to go back to the stone, indoors, which will be a convenient place to stay warm in Maine this winter. Or maybe heat the stone right on the grill, in these waning days of warmth? Hello, I’ve been baking home-made pizza (making my own dough and sauce) for about 9 years. I’ve used a stone for 8 years and parchment paper for the past three years (used pans prior to switching to stone and parchment). I pre-heat my oven to 550 degrees, and the parchment paper I use (Reynolds Genuine Parchment Paper) works just fine at the 550 degree temp. Sure, it does get brown, but it doesn’t ignite unless it comes into direct contact with the heating coil (electric oven). Furthermore, in baking my pizzas, I have the stone positioned on the very top shelf in the oven. About ten minutes before I put the pizza in, I switch the oven setting from ‘bake’ to ‘broil.’ This switches on the top-most heating coils in the oven, so when the pizza goes into the oven, it’s going on to a stone whose cooking surface has been additionally heated overhead by the broiling coils. Furthermore, by cooking the pizza on the top shelf of the oven using the Broil setting, the pizza is completely cooked in about 3 to 3-1/2 minutes. I do remove the pizza after the first two-and a half minutes, and rotate it half-turn and then put it back in for another minute or so. I’ve had excellent success in this top-shelf broil method, and I think it’s about as close to baking in a wood-fired oven as I can achieve using an electric oven. Interestingly, I’ve also recently seen this method used on a cooking show where professional pizza chefs were showing how to make home-made pizza.